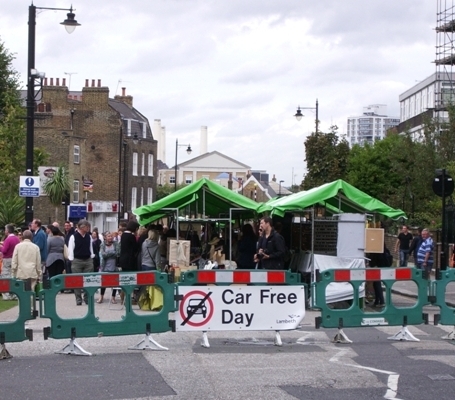 On Sunday 19 September 2011 an area of Clapham Oldtown was designated as car free with barriers put up and turf was laid on the road in place of cars and other motor vehicles. A series of musical, dance and theatre displays entertained passers by and stalls operated selling food and drink, pottery and other items. The event was put on to celebrate European Car Free Day. It also worked to give a taste of what the area could be like if the proposed Clapham Gateway Scheme gets the go ahead. This scheme is proposing the removal of the bus stand in centre of the site, the removal of the eastern carriageway to through traffic and the creation of a new piazza area. Members of the public were generally positive and supported the car free Clapham vision. That weekend other parts of Lambeth were of course effectively car free too due to the visit of the Pope rather than any car free initiative. This has led many to ask why it requires special events to show the improvements brought by fewer cars on the roads. We hope that Lambeth can work effectively to make more of the borough car free more often.